I purchased a lot of products when my children were babies but the one “must have” item for all three little ones were my collection of Halo SleepSacks. These wearable blankets gave me piece of mind that my babies were warm and snuggly but would not have the potential for a blanket to cover their airways while they were sleeping. Halo SleepSacks have been keeping babies covered safely since 1994 and is the “#1 choice of hospitals and parents alike.” My favorite Halo products for my newborns were the Halo Swaddles which kept babies safely nestled in a comforting “cocoon.” As they got older, I loved the easy zip up 100% cotton blankets and the organic sleepsacks which are available in various sizes. Anytime a friend of mine is having a baby, I always make sure that they get at least one Halo SleepSack from my family as a baby gift. I was also impressed that a percentage of Halo Innovations’ profits are donated to charities that work to fight against SIDS. For the month of October, Halo will donate $1.00 to SIDS awareness for each new Facebook fan to join their page. I encourage every Simply Stacie reader to consider joining the fight against Sudden Infant Death Syndrome on Facebook. I remember that I had to constantly remind my parents to make sure that they didn’t put my babies to sleep on their sides or stomach when they were sitting for us…..don’t be afraid to educate ALL caregivers about the safest sleep practices for your baby. Halo SleepSacks are now available in Target stores and come in the most adorable of styles. To learn more head over to the Halo website. You can also follow Halo on Twitter and don’t forget to head over to their Facebook page to promote SIDS awareness. 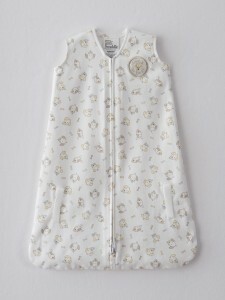 I would love to get the blue micro-fleece sleep sack with the dog applique in large. I follow Halo on Twitter. I’m a Facebook fan of Simply Stacie. I’m a Facebook fan of Halo. I’d choose the Disney Sleepsack Wearable Micro Fleece Blanket in Sage. So pretty! voted for you on Picket Fence Blogs 11/15.